One day I was surfing the web and came across this amazing video light mapping presentation by The Macula project. 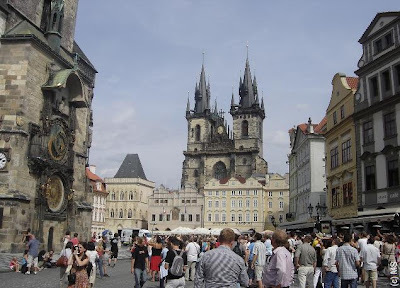 It was the celebrations of the Prague Astronomical Clock 600th Anniversary! 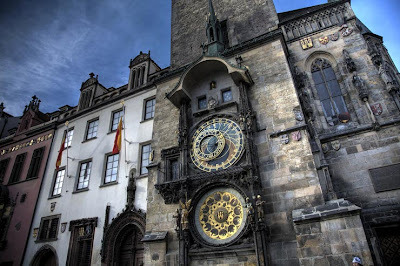 The 10 minutes video / Light mapping was projected on the outside wall of the Old Town Hall on which the astronomical clock is installed. 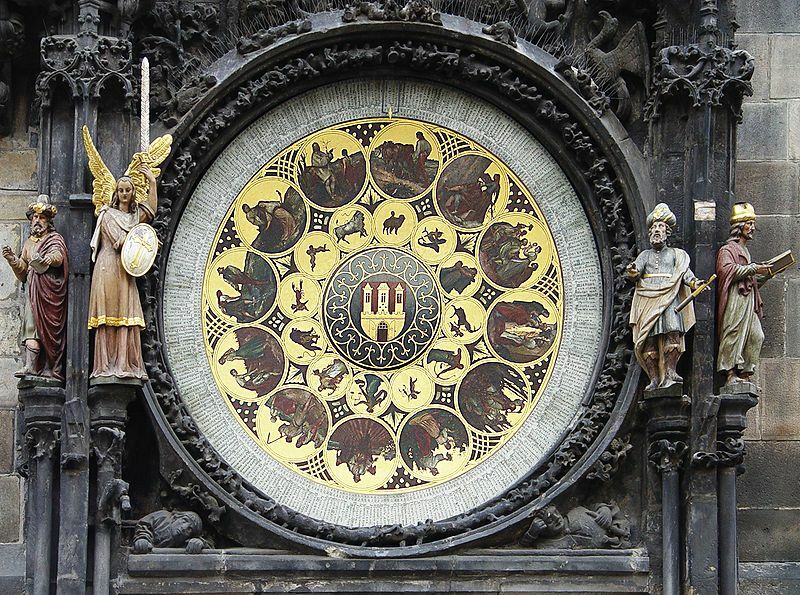 The Prague Astronomical Clock or Prague Orloj is a medieval astronomical clock located in Prague, the capital of the Czech Republic. The clock was first installed in 1410, making it the third oldest astronomical clock in the world and the only one still working. The astronomical dial is a form of mechanical astrolabe, a device used in medieval astronomy. 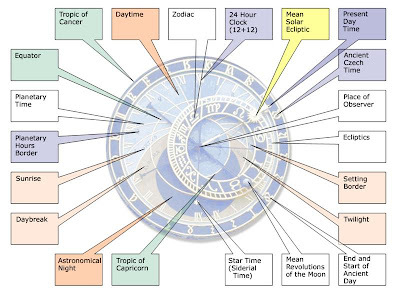 Alternatively, one may consider the Orloj to be a primitive planetarium, displaying the current state of the universe. 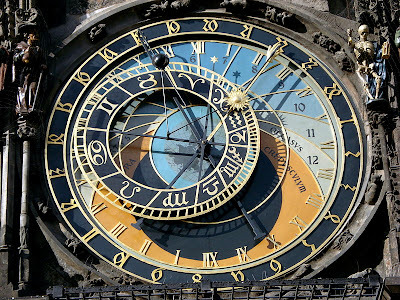 The astronomical dial has a background that represents the standing Earth and sky, and surrounding it operate four main moving components: the zodiacal ring, an outer rotating ring, an icon representing the Sun, and an icon representing the Moon. "The Walk of the Apostles"
A clockwork hourly show of figures of the Apostles and other moving sculptures, The four figures flanking the clock are set in motion at the hour, these represent four things that were despised at the time of the clock's making. From left to right in the photographs, the first is Vanity, represented by a figure admiring himself in a mirror. 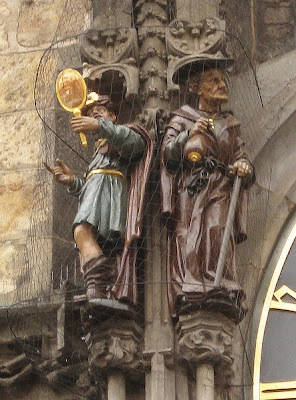 Next, a stereotypical Jew holding a bag of gold represents greed or usury. Across the clock stands Death, a skeleton that strikes the time upon the hour. Finally, the Turk tells pleasure and entertainment. The Calendar is the bottom part of the Orloj with month symbols painted by Josef Manes in 1805. 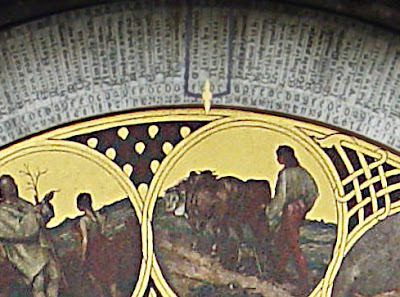 The newest part of the clock is the Calendar Dial. 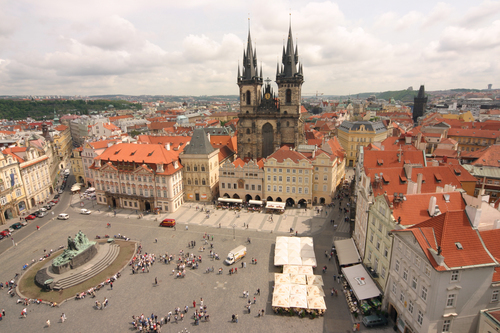 There is the Prague Old Town symbol in the centre. The rotary outer circle describes every single day of the year, and the current date is indicated at the top. There are also medallions with zodiac signs and with pictures depicting every month. 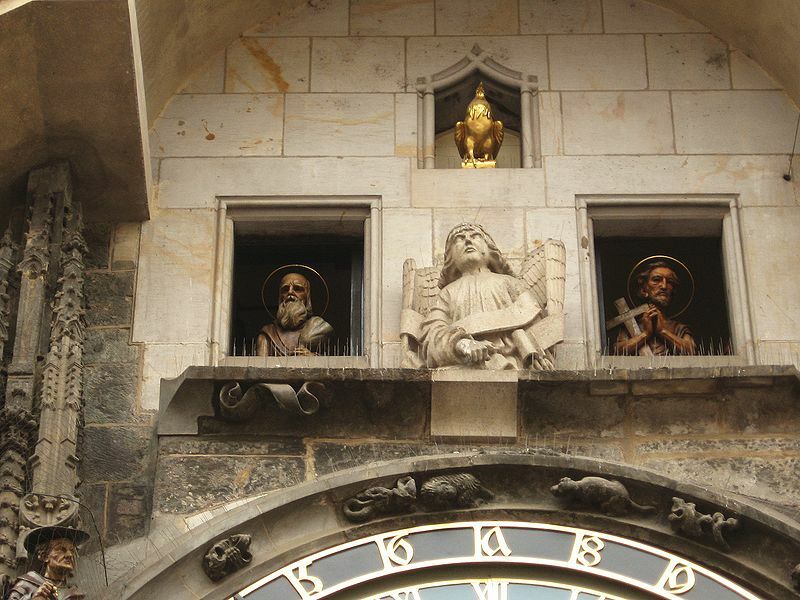 On October 9, 2010, the Clock's 600th anniversary was celebrated with a light show on the face of the clock tower. Two 2x Christie 18K HD projectors, each with a 1920x1080 resolution, were used to project several animated videos on the clock. 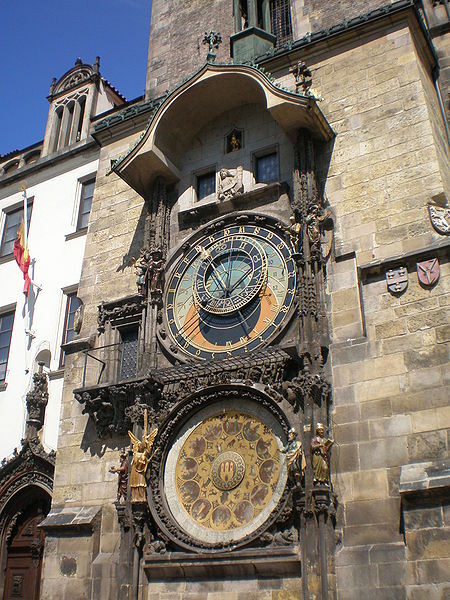 The videos showed it being built, torn down, rebuilt, and peeled away to show its internal mechanisms and the famous animated figures, as well as various events in the clock's history. The video interacted with the tower's architecture, such as rain rolling off the arch, and showing the passage of time with moving shadows. 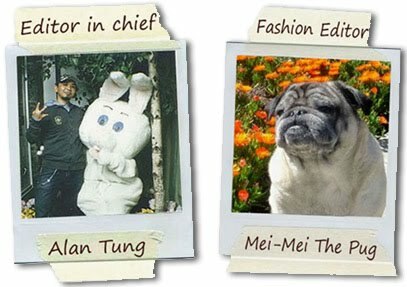 The show was developed over the course of four months by the macula, Duber Studio, and Michel Kotek, and was presented by AV Media. Remember the feeling when you were 7 years old & watching the fireworks at the Disneyland? be prepare to have your mind blown away! Here is the video of this magical presentation! We hope you enjoyed this amazing video! 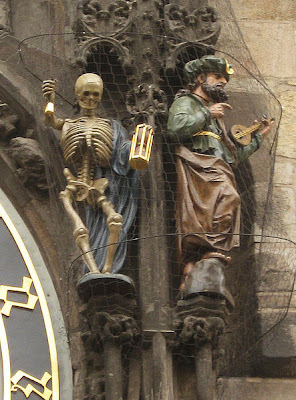 I can't wait to visit Prague to see this clock in person!